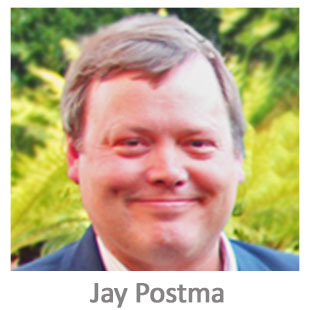 Jay Postma is the President of MSB Compliance based in Atlanta Georgia. Jay has over 25 years experience in the Banking, Financial Services, and Software Development industries. At the Federal Reserve Bank of Atlanta’s New Orleans and Atlanta branches and later at MCI Telecommunications, Jay became known for his skill in turning around troubled operating departments, bringing these departments into compliance with regulatory requirements, improving productivity and customer service, and in controlling costs. As a founding principal of Towne Services, publicly traded on NASDAQ prior to its acquisition, a provider of services and products that process sales and payment information and related financing transactions for small businesses and community banks in the United States, Mr. Postma served as Vice President, Operations. Mr. Postma was instrumental in developing the company’s products and pricing strategies, and in creating the product features, requirements, and processing logic. As a founding principal of El Banco Financial Corporation and its subsidiary El Banco de Nuestra Comunidad, Mr. Postma served as Vice President and Secretary. El Banco was a financial services company focused on providing traditional and non-traditional bank and financial services to the un-served and under-served Latino immigrant market. The core of the company now operates as Ingo Money providing check verification services to banks and MSBs and is a client of MSB Compliance. He later served as Vice President, Division Operations Manager, and Bank Secrecy Act Officer with Flag Bank until its acquisition by RBC Centura. In this role, Mr. Postma advised executive management and the Board of Directors of increasingly stringent BSA regulatory expectations and revised, developed and implemented formal compliance policies and procedures. Jay has significant experience working both as an employee and as an entrepreneur with banks, financial service companies, and business customers. He has built and reinvented Operations and Customer Service departments and managed both growing and diminishing operating departments. Jay is also a founder of Digital Currency Solutions which provides ongoing review and analysis of compliance and operating risks of entities engaged in digital currency services while also performing financial reviews in accordance with traditional surety bond underwriting procedures. DCS has secured an exclusive partnership with one of the world’s largest surety carriers to provide a national surety bond solution to the digital currency market. Jay holds a Bachelor of Science in Management Science from the Georgia Institute of Technology. He has achieved recognition as a Certified Anti-Money Laundering Specialist (CAMS) through the Association of Certified Anti-Money Laundering Specialists (ACAMS),he is a member of the Association of Certified Financial Crime Specialists (ACFCS), he is a lifetime member of the Bitcoin Foundation, he helped to organize the ACAMS Atlanta Chapter and currently serves as Co-Chair of the group.